The Empress card is one of maternal instincts, fertility, growth and domestic bliss. However this fertility is not necessarily just in terms of human pregnancy. Indeed this card, symbolic of nurturing, can mean the nurturing of a wide variety of things, for example: a new venture, business idea, new romance, new relationships and anything that takes the form of being created and grown. It can also signify that you have got a strong desire to have love and affection in your life. Although the card is symbolic of pregnancy, in a business sense this card can suggest some level of home working and the success of upcoming projects. Therefore if you are embarking upon something new, the Empress card is a really good card for you. 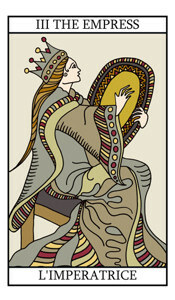 In a relationship sense, the Empress indicates a partnership or union within which both partners are happy. You are entering a fertile period of your life in both a creative and spiritual sense. Early cards showed the Empress as a pregnant lady and the card can sometimes mean marriage, pregnancy, births and prosperity, but it is possibly better to think of the Empress card as the archetypal mother who helps to look after the querent's affairs. A stately figure, seated, having rich vestments and royal aspect, as of a daughter of heaven and earth. Her diadem is of twelve stars, gathered in a cluster. The symbol of Venus is on the shield which rests near her. A field of corn is ripening in front of her, and beyond there is a fall of water. The sceptre which she bears is surmounted by the globe of this world. She is the inferior Garden of Eden, the Earthly Paradise, all that is symbolized by the visible house of man. She is not Regina coeli, but she is still refugium peccatorum, the fruitful mother of thousands. There are also certain aspects in which she has been correctly described as desire and the wings thereof, as the woman clothed with the sun, as Gloria Mundi and the veil of the Sanctum Sanctorum; but she is not, I may add, the soul that has attained wings, unless all the symbolism is counted up another and unusual way. She is above all things universal fecundity and the outer sense of the Word. This is obvious, because there is no direct message which has been given to man like that which is borne by woman; but she does not herself carry its interpretation.In another order of ideas, the card of the Empress signifies the door or gate by which an entrance is obtained into this life, as into the Garden of Venus; and then the way which leads out therefrom, into that which is beyond, is the secret known to the High Priestess: it is communicated by her to the elect. Most old attributions of this card are completely wrong on the symbolism as, for example, its identification with the Word, Divine Nature, the Triad, and so forth.